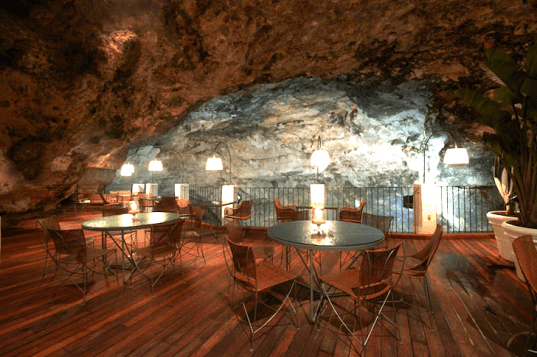 Noblemen and women have sought out the tranquility of this natural limestone grotto in Southern Italy for hundreds of years, and now it has been transformed into an exclusive Italian restaurant called The Summer Cave. Located in Polignano a Mare, the boutique Grotta Palasezze hotel boasts two restaurants, but the grotto is only open during summer months. The clifftop Grotta Palasezze has 20 rooms overlooking the Adriatic Sea and the old town of Polignano o Mare. Dimly lit and outfitted with furnishings made simply from natural materials in order to blend in with its unique surroundings, the restaurant sits just below the hotel and boasts magnificent views. 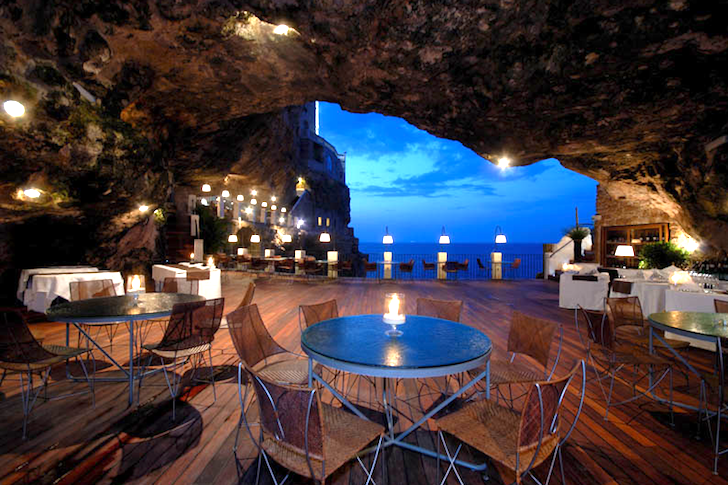 The Summer Cave has been voted as one of the most romantic restaurants in the world by the Fodor travel guide. We’ve never been, so we can’t attest to that, but we do think a grotto is one of the most interesting locations to place a restaurant. Similar examples of restaurants in unusual settings include a restaurant shanghaied on an island in the Indian Ocean and another set at the foot of an active waterfall. Christine, I think you're better off contacting the restaurant directly. Thanks, Inhabitat editors. I will be visiting Sicily later this year, arriving 30 September. Our base will be Castellammare and I am wondering if you would be open at this time or could accommodate a group of 10 ?? Thank you - I\\\\\\\'m a Travel Agent in Australia and will be bringing a group of 15 with me but will offer this as an Optional Extra special tour if we could enjoy your hospitality. Thank you, Christine. I love this. It's on my list of places to eat! Nudging is good. Thanks for the heads up! We've fixed our error. This is on the Adriatic, not the Mediterranean, not to be a nudge, but I have a house nearby, and dine here regularly. Above the restaurant are 20 rooms that are also tucked into the seaside cliff!